Here in Kerry, there are some fruits that are hard to get in the depth of Winter, but you can always find bananas. They might not always be ripe, and most of the time I will pass them by when in the supermarket, discouraged at the green peel. For, as bananas ripen, the starches turn to sugar, and once they do so, this sweet, complex, rich, and velvety fruit can boost energy and give any occasion a lift, especially when it’s in ice cream. 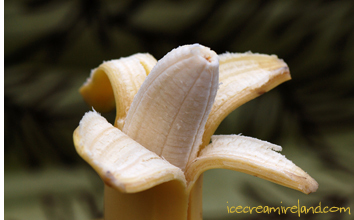 All fruits in ice cream should be ripe, and with bananas there is hardly such a thing as too ripe. If you have bananas left over with brown spots on the skin, perhaps ones that the kids wont touch or that even strike you as too soft, then they are perfect for ice cream. We have used bananas when the skin had turned completely brown, and the result was delicious. Bananas, oddly enough, ripen best off the vine, and if all you can find are greenish bananas, please wait to make this ice cream and let them ripen. I have added some chocolate shavings because I love the bitter bite of dark chocolate with banana. Combine the bananas with the lemon juice and blend or mash until smooth. Place in a small saucepan, add 30 g (two tablespoons) sugar, and cook over low heat, stirring all the time. Don’t over-cook. Once it has warmed, it should release a strong banana aroma, and that’s enough! Beat the rest of the sugar and egg yolks together until thick and pale yellow. Bring the milk to a low simmer in a small saucepan. Remove from the heat. Transfer the custard into a small container, cover, and refrigerate until cool (5C). 12. Whip the cream until it has doubled in volume (you should have soft peaks – don’t over-whip). 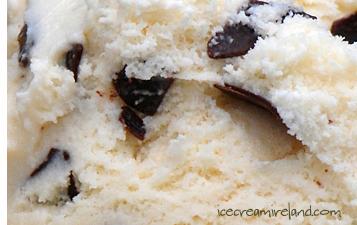 Freeze using a domestic ice cream machine until it has a semi-solid consistency, or cover and place in the freezer, stirring occasionally to break up the ice crystals. Use a vegetable peeler to create the chocolate shavings, and add them to the ice cream once it is reasonably solid, or they will all sink to the bottom. Of course, you don’t have to add chocolate shavings if it’s not to your taste. To pasteurise the eggs, heat the custard to 73C and maintain that temperature for at least 5 minutes. Use a cooking thermometer, and keep stirring! If the custard goes any higher than 76C, the eggs will scramble. Immediately cover and place in the freezer until cool. Glad I’m not the only one that never understood yellow banana ice cream. What a delicious ice cream flavor!!! 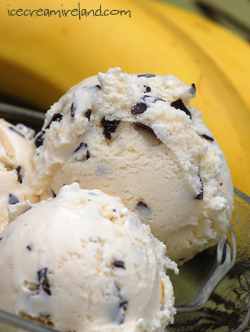 Banana and chocolate are so great together. Wow! That looks great. Kieran, have you ever used agave nectar to make ice cream? Thanks, guys! Deb – never on its own, but we did use it as part of a tropical sorbet. Is it great? Hi Kieran, One of my fave ever Ben & Jerry’s flavours was chunky monkey – I haven’t been able to get my hands on a nice banana ice cream since. I’ll be trying this for sure!!! I use it pretty exclusively instead of cane sugar. You just need to cut the total amount of other liquids a little to adjust for consistency. Here’s a link to a mint carob chip ice cream I made with agave (I made a short film about the experience as well): http://alteredplates.blogspot.com/2007/07/best-mint-carob-chip-ice-cream-ever.html. I have tasted this in your shop and it is beaten only by rum and raisin for me, the divinest banana flavour EVER, amd making this at the weekend 150%. I can almost taste it now!!! This sounds really interesting. Now you got me thinking about coconut and other “tropical” fruits that are off the beaten path when it comes to ice cream. Do you warm the chocolate a tiny bit to get such nice shavings? I’d like to get better at making sturdier, thicker shavings that are not chunks and not too thin. Thanks for that, Deb. Definitely worth checking out! I’ll have to indeed play with that. And Rachel, let me know how it comes out! perfect recipe for winter! banana would have been great, but adding chocolate is genius! this is our next recipe to try! My absolute favorite ice cream- just add walnut and a beautiful bowl to eat it out of! Hi Kieran, tried this at the weekend and broke in my mum’s ice cream maker in the process. However, I didn’t realise the ice cream machine bowl had to be left in the freezer overnight!!! What a pain… I was left with a banana & cream mush. I’m down, but not out – going to try it out again this weekend!!! Hi, great site, intending to try this out. Just one question, what type of cream should be use? I.e. the fat content. We use cream with a fat content of 40%. In Ireland, that’s normal cream. In most other places it’s “heavy” or “whipping” cream. I was thinking about making an alcoholic version of this, and was wondering what would go best with it. Thought about replacing the chocolate with coconut and using a tropical flavored rum, but perhaps the tropical variety isn’t even necessary? You can definitely add rum to this flavour – I’d suggest a dark rum and do it by taste – start with a tablespoon. As for the coconut, what I would do is toast some dessicated (shredded) coconut in a dry pan, stirring until it is golden. Use it instead of the chocolate shavings. Let me know how you get on! I just made this, and it was awesome. I, however, prefer a denser ice cream, so I opted out of whipping the cream. It turned out just as I wanted, and is superb! I made your kahlua ice cream last week (whipped the cream that time), and it was heavenly, as well. Thanks you so much for sharing your recipes with the world; I’m using your site as my ice cream bible from now on! Can’t wait to try to Guinness ice cream on my boyfriend next!